Now-a-days the media is gung-ho about electric cars and everywhere you can read about the $100,000 worth of Tesla electric sports car that is going to hit the market pretty soon. Petroleum prices have skyrocketed in the last year and everyone is feeling the pinch during their visits to the gas stations. This has led automakers to bring out new electric vehicles and entrepreneurs across the globe are trying to secure venture capital, since nobody is concerned about recharging the batteries of their electric cars. Take the example of a person, named say Joe, who owns a Corvette, a high performance car from General Motors, which according to the company can achieve 25 miles per gallon. If Joe drives carefully and achieves this performance then, if he commutes about 1000 miles in a month, he pays around $160 for gasoline at $4.00 per gallon. Here, he can think about buying the Tesla and will gather necessary data, not only to clear his own doubts but also to convince his family members. An electric vehicle accelerates faster than a gasoline car and hence Joe can enjoy faster acceleration from Tesla than his Corvette. Though both electric motors and liquid fuel engines convert electric energy and petroleum fuel energy, respectively, into mechanical energy; however, these two are different devices and electric motors can generate much higher torque at the wheels at much lower turning speeds. Nevertheless, electric motors have their shortcomings too, the main factor being they are going to pollute the environment more; so long coal is burned to generate electric energy. Another major drawback is the small number of miles that an electric car can travel after a complete recharge. Moreover, charging an empty electric battery is time consuming and the high performing batteries are not only expensive but have limited life span too. Therefore, the overall energy efficiency of an electric car is far worse than that of a modern automobile powered by an advanced combustion engine. Both these types of vehicles need to store energy to travel; an electric car stores electric energy in its battery while combustion engine powered cars stores petroleum products in the fuel tanks. Now let us look at the travelling cost of both these cars for 100 miles. If we assume that both cars require the same amount of power to travel this distance, then the match-up between Tesla and Corvette is perfect. The Corvette engine, which is a typical heat engine, converts energy from gasoline into mechanical energy with an efficiency of about 35%; however, electric motors convert electric energy into mechanical energy to about 85%. The energy content of every gallon of gasoline is 131 MJ (mega joule); hence, to run 100 miles the Corvette will require 4 gallons of gasoline or 524MJ. Since, only 35% of the energy is converted, Corvette will use 183MJ to cover the 100 miles, when mechanical energy is transmitted to the rear wheels. Since both Tesla and Corvette are very similar in size and driving characteristics; virtually the same amount of energy is transmitted to the wheels of Tesla to cover the aforesaid 100 miles. However, the Tesla will require a bit of more energy since it loses energy by charging, storing and discharging electricity in the battery, which amounts to about 15% of the converted energy and will not be available to propel the car. Therefore, Tesla will require 1.15 times of the energy required by Corvette or 211MJ to cover 100 miles. The average price of electricity in the United States is $0.09/KWh (kilowatt hour) and the factor for converting energy measured in MJ to energy measured in KWh is 0.2778 KWh/MJ. Therefore, to cover the distance of 100 miles Tesla will require 58.6 KWh of electricity at a total cost of $5.28, whereas Corvette will cover the same distance at a cost of $16. 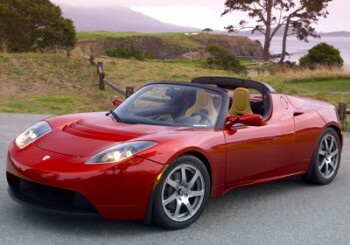 The Tesla costs $100,000 whereas Corvette is priced between $50,000 and $75,000. Looking at all the comparisons, you can decide about the best deal.